then how can I expect the clients to. 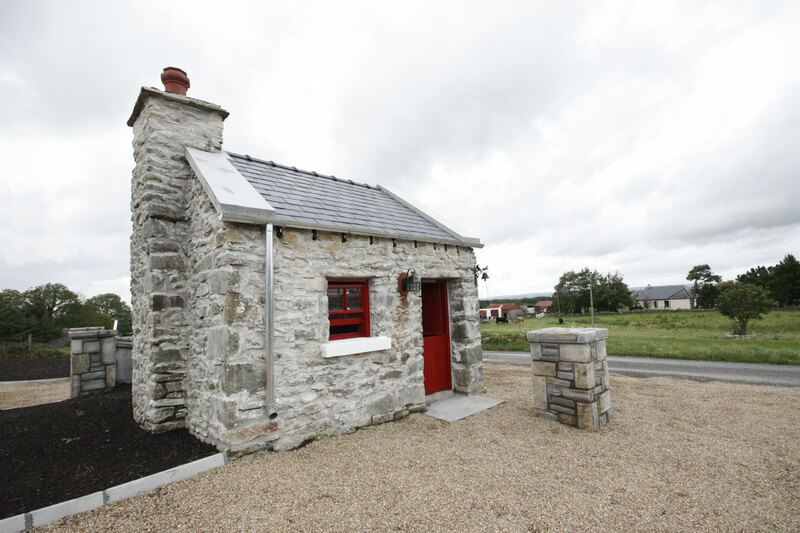 Irish cottages and how they fit into 21st century living. built bed for Granny or Granddad to sleep in. hand; stones for the walls, salvaged timber and thatch for the roof. disrepair and to give the building a future for many years to come. increase the level of damp in a property rather than eliminating it. in restoring properties of this period. For more information on using Lime in your building, the book ‘Lime Works’ by Patrick McAfee is a brilliant resource on lime for render, mortar and floors. in what manner should it be extended? enhance the original house rather than detract from it. creates a ‘separation’ between the existing and the new. 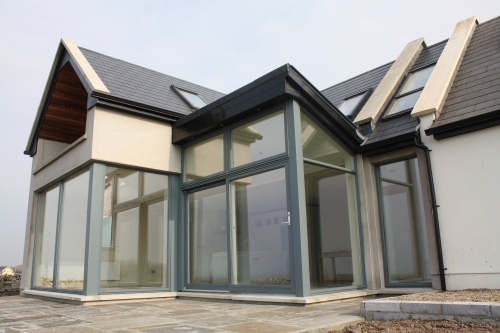 Glazing detail from recently completed house extension in County Clare. Here we stepped glazing with inverted mono-pitch roof together with the 1.0m buffer zone. with a simple copy of the old. The restoration looks great, but I’m not so sure about the modern extensions. Especially the first one looks way to modern for my taste, but the second one (the one made mostly of glass) might not be so bad. I wanted some advice about our Irish cottage which uses an enormous amount of fuel (logs) in the 3 chimneys. Two have wood burning stoves installed and there is also oil fired central heating but it is really eating money for little return. Should we dispose of one chimney and knock two rooms into one with one fire? Also, it is a holiday cottage so the chimneys get damp when not in regular use. Can you please help? Hi Kevin – brilliant comment! I really want to get out and photograph more cottage renovations this year – would you be interested and you can tell your cautionary tail about insulation and traditional methods. I would love to give all sides of the story – not just what people ‘should’ do but what works and problems that renovators have faced. Pop me an email at orla@cottageology.com if you’d be interested! Hi Paul – fantastic comment, it is easily one of the biggest issues that cottage renovators face – thank you for taking the time to write this! I know this is an old message but i would love to know more abt your renovation as I am starting one myself. Pls email me if possible. I’m currently going extending and building out the back of my 19th century cottage but I can not get an engineer to over see the house because they can’t certify the old building. They have all said they will do it if I knock the cottage and rebuild the same. Can this be done without planning? It’s been said to hit it with the digger and work away but I’d enough trouble with the planners so don’t really want more. Any help will be great!!! Hi David – The new regulations has everyone terrified into paralysis so your best bet will be to put your query to the Building Regs Forum – http://www.bregsforum.com/ Its a voluntary group of architects who are interpreting the new regulations and lobbying for clarification and change. I will also see if anyone can help on FB or twitter. 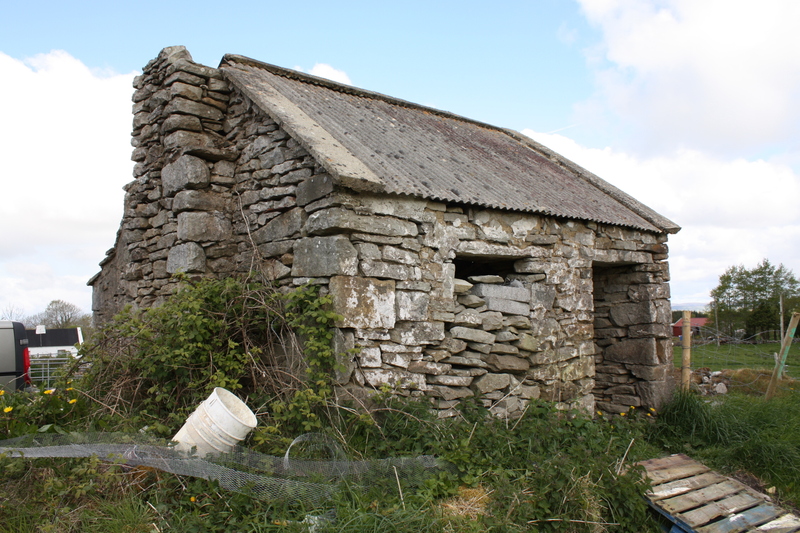 Hi.Im about to return to Ireland and want to buy a cottage possibly in Mayo and restore it to a reasonable and very simple living standard.Would 50-70 k be a realistic figure incl property cost? I’m afraid I have no answer for you on this – it is a case of how long is a piece of string. Even if you already had a cottage it would be impossible to forecast a budget without a detailed engineers report and a plan for what you want to achieve. People have renovated cottages on a shoestring but they generally do the work themselves, salvage and/or have access to free/cheap labor, materials and services. Best of luck if you do decide to come home & keep in touch if you decide to go ahead with a renovation :-). Hi Lisa, design questions are really subjective – ideally you should try to quickly mock up the shape of the cottage in something like Google Sketchup and composite it on an image of the site to get a better idea of how it would look in situ. If it is outside your comfort zone – ask an engineer or architect. I’ve often seen two differing styles from traditional to contemporary on one building especially when there is an extension to a heritage building – sash windows rarely suit a contemporary extension! Hi Steve – sounds exciting! I know that the owners of Old Farm Cottage did something similar though they just extended into Babe’s Room (which was an attached piggery which was beside the building). As always with these things – the only thing to do is to talk with a local engineer or architect. Its been a while since I dealt with planning authorities but I found that they were pretty helpful when it came to pre-planning meetings too – perhaps that is all you need. I hope that is of some help :-)! Hi. We have a rubble wall house about 100 years old. Walls are about 8 inches thick. Laois/Kildare border. Dry lined and fairly easy to heat. We are planning on changing the windows and thinking of adding external insulation at the same time. 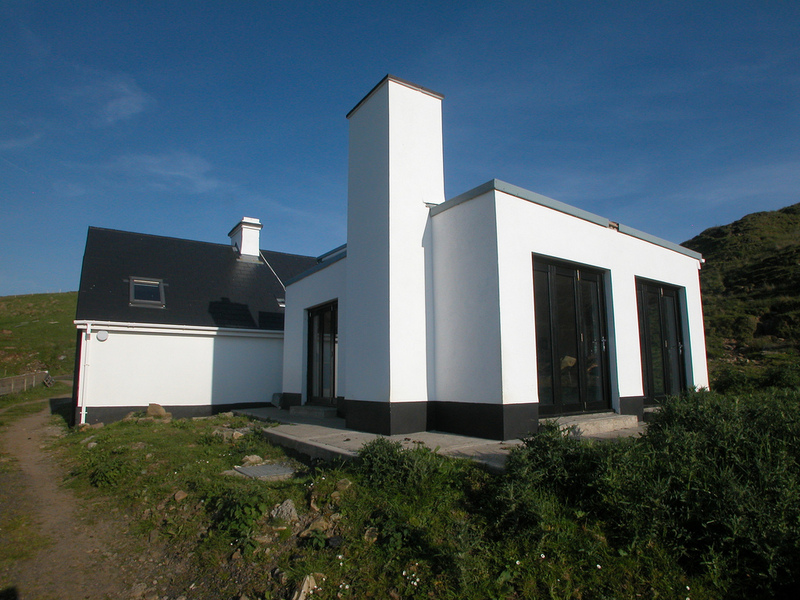 Any thoughts on external insulation and the implications for this type of house? Hi Charlie, I’m afraid that I am not qualified to give advice on structural issues – your best bet is to take with a good structural engineer (one that is a friend of conservation preferably) or a conservation architect – see here for the directory: http://www.riai.ie/practice_directory/. Forums and online advice can only take you so far but insulation is important and expensive so it is best to get advice that you can rely on! We want to build a traditional Irish cottage next summer here in the US. Are yhetr any guide’s, books, references we can access? We have a 2 room traditional cottage no electricity water or sewage poor access grass lane for tractors at mo but in love with it and plot where do we start? Hi Lesley – did you ever get an answer on this – I would be interested to know the answer myself as I’ve never been asked this question before! I’ve often thought about that myself – a caravan on site would be ideal, I know many people do it but does it require planning permission – will put it out there on the Facebook group. What would you recommend as a damp proof membrane for floor in a rubble/mud wall 150 year old cottage? Is a sand and lime mix suitable for the floor?